The Rev. Richard E. Fichter, Jr. The Rev. Richard Fichter, Jr., is a native of Fairfax County, Virginia. He graduated from Virginia Tech in 1990 with a major of computer science and a minor in religion. After spending about eight years in the computer industry, he entered Virginia Theological Seminary in Alexandria and graduated in 2001. He was ordained deacon and then priest in the Episcopal Church in 2001. He has served as various forms of assistant clergy at St. Paul’s Beaufort, NC; Grace Church, Kilmarnock, VA; and Christ Church, Winchester, VA. He served over eight years as priest-in-charge at Christ Church, Gordonsville. Richard enjoys traveling. He has had many opportunities to travel domestically and internationally including visits to Russia, much of Northern and Eastern Europe, Israel, and India (1997 for sight seeing and 2005 on a mission trip with Five Talents). More recently his travels have been mostly via cruise ships in the Caribbean. 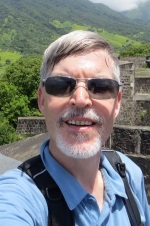 Richard enjoys hiking, especially in the Shenandoah National Park, and photography. He also is a fan of science fiction and fantasy movies, TV Shows, and books. On June 1, 2017, Richard began his tenure as part-time Rector of Hanover-with-Brunswick.